In recent decades, airports have transformed from simple transportation facilities into sophisticated urban centers. Two factors are driving that process. On the one hand, successful airport authorities understand how important it is to maintain a balance between aeronautical and non-aeronautical revenue sources. Non-aviation activities ‘on the ground’ are a critical source of income, helping to fund both day-to-day operations and long-term capital investments. And when there’s a sudden downturn in air traffic, non-aeronautical income helps to mitigate the drop in revenue that airports derive directly from aviation. At the same time, savvy urban leaders who recognize the airport’s significance for the regional economy are building new districts near the airport to advance broader urban development goals. Taken together, these two trends have led to the construction of hundreds of ‘aerotropolis’ and ‘airport city’ projects over the past 25 years. Yet among airport planners, it’s an open secret that the aerotropolis concept – which looks great on paper – actually doesn’t work very well in practice. While a handful of these projects have been highly profitable, most of them have not been able to deliver a significant return on investment. It’s important then to think about how we can build on the strengths of the aerotropolis idea, move beyond its shortcomings, and update it for the demands of the 21st century airport – and the 21st century economy. Since the early days of civil aviation, airport planners have tried to devise productive ways to integrate the airport into the city and to use the airport as a springboard for developing the real estate around the airfield. In the 1920s and 1930s, they suggested combining airports with other building types, such as amusement parks and exhibition halls. They also proposed building satellite towns, or even entire new cities, around the airport. Like the railway stations of the 19th century, airports would become the focal point of urban growth. The notion that airports could serve as centers of urban development remained popular throughout the 20th century, but the idea never came to fruition. However, in the 1990s, the economist John Kasarda recycled some of these older concepts into a development model that he called the ‘aerotropolis’. He argued that the airport of the future would assume the role that traditional downtowns had played before. Kasarda claimed that in a globalizing economy, accessibility to air transport would be essential for doing business. Land located near the airport would become a desirable place to build corporate headquarters, convention centers and conference facilities. The airport would also attract logistics firms that handle high-value products and time-sensitive cargo, such as medicine and flowers. This was a really interesting idea, but the problem is that it’s just not true. Simply put, the airport doesn’t have the ‘pull’ of historic city centers, which have steadily regained their attractiveness over the last 20 years. If anything, multinational corporations and the people that work for them want to be downtown now more than ever, in attractive, walkable, mixed-use neighborhoods. What about logistics companies? Well, they tend to set up shop wherever it’s cheapest to do so, as long as it’s within a one-hour drive of the airport. Storing cargo right next to the airport is often a lot more expensive and a lot less appealing than elsewhere. of failed aerotropolis projects on every continent. The major consensus seems to be that the aerotropolis simply doesn’t meet the demands of today’s airports. In contrast to the aerotropolis, airport urbanism (AU) is a people-focused approach to planning the urban districts that surround major airport hubs. AU leverages existing assets in the airport area to create a new type of urbanity that provides long-term economic benefits to the airport and to the city that it serves. Whereas the aerotropolis starts with a predetermined set of building types like office parks and logistics hubs, airport urbanism starts with people – specifically, the people who live, work and travel around the airport. Whereas the aerotropolis takes a one-size-fits-all development approach, airport urbanism emphasizes each airport’s unique user profile to generate site-specific development strategies that engage with the needs and desires of the people who live, work and travel around the airport. But why is this necessary? Because ultimately, the economic dynamics at the airport revolve around three sets of actors: the airport (and its employees), the passengers, and the residents of local communities who live, work, and operate businesses near the airport. Successful airport projects are designed with the desires of these three groups in mind. Strengthening the relationship between them is a powerful tool for increasing non-aeronautical revenue, improving the passenger experience, and growing the local economy. To strengthen the relationship between these three actors, airports, developers and urban planning agencies can apply the following three-step AU research method. First, identify pre-existing assets ‘on the ground’ that can be leveraged in future development projects. What industries, attractions and skills are already located there, and how could potential synergies with the airport be incorporated into its future strategy and plans? Secondly, uncover the desires of the people who use the airport on a regular basis – passengers, residents, employees – and determine how airport-area developments can satisfy those needs. What kinds of services and amenities are currently missing in the airport area, and how could the urban districts being built around the airport help to address those unmet demands? Finally, connect these local factors to broader technical, spatial and demographic changes that are taking place in the aviation industry and at airports all around the world. This enables the airport to see how it fits into the larger overall global picture. This three-step approach produces a site-specific development plan that celebrates each airport’s unique user profile. Throughout that process, it is important to focus on eight key drivers that fundamentally determine the success or failure of airport-area development projects. The first four of those drivers reflect the needs and desires of the people who populate the airport area: passengers, residents, local business owners, and employees of the airport and airlines. The other four capture the spatial, regulatory and promotional tools that are needed to successfully implement any airport development plan. Of these eight drivers, three of the most important are: what passengers want, what residents want, and branding. Passenger demographics are changing fast and so are their needs. Many airports try to cater to high-income professionals by planning office parks and conference centers. That might make sense in cities that have a lot of origin and destination business traffic and where office space is in short supply, but it’s less relevant for airports that are leisure destinations, transfer hubs, or host a lot of low-cost carriers. For AU to really take off, it’s important to match your real estate developments with the needs of the specific passenger types that are passing through the airport. Do you have a lot of older travelers, or passengers from developing countries? Consider medical tourism before you invest in that conference center. Does your airport host many tourists who are visiting your country for the first time? Then you’ll want to think about how to curate those memorable first and last experiences, and focus on tourist-oriented retail and food and beverage options, interwoven with attractive exhibitions of local culture. For younger passengers, a concert arena could be a sound investment. Study the top 10 destinations from your airport – do travelers on those flights have specific spending habits or dietary needs? All of these questions are essential before you start planning. Less successful airports think of local residents as troublesome ‘stakeholders’ whose complaints about noise and air pollution can constrain future growth. Successful airports, on the other hand, view local residents as potential customers. For example, Singapore’s Changi Airport built a variety of attractive playgrounds, parks and children’s education centers landside. As a result, the airport has become a popular weekend destination for families, who meet there to eat and shop. Changi also built a resort hotel in the airport’s forecourt. It quickly became a fashionable place for locals to get married, or to enjoy ‘staycations’. Changi’s forthcoming Jewel complex will have similar features and aims. Around the world, these kinds of community-focused design changes have led to a big improvement in local residents’ perception of the airport, while also helping to increase the amount of non-aeronautical revenue. Understanding residents’ desires is an important step toward profitable landside developments. Successful airport projects establish a clear brand identity early on in the planning process. It’s crucial to articulate a compelling promise of what the new project aims to achieve, and to communicate that vision to investors and the public at large. Apart from a few industry wonks, very few people can relate to technocratic concepts like the ‘aerotropolis’ and ‘airport city’. How can your airport craft a story that allows both investors and everyday folks to connect with the project’s broader goals, and to become enthusiastic about its potential to bring vitality to the airport area? And how can that vision be broadcast through media, exhibitions, public events, and word of mouth? Communicating that vision, and identifying the steps needed to realize it, is one of the biggest and most important drivers of airport development project success. A cookie-cutter approach to developing airport real estate simply doesn’t work. 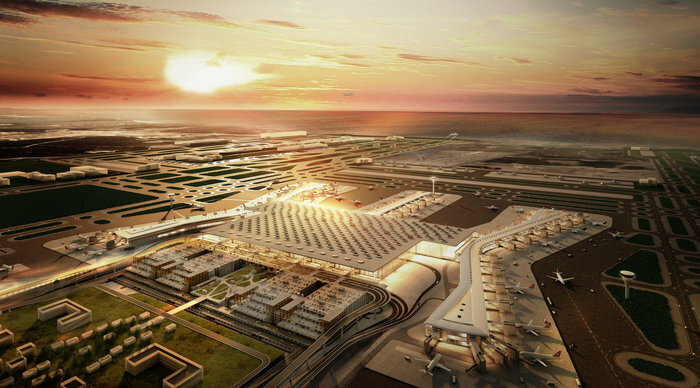 Instead, successful projects address the specific needs and desires of the airport’s unique passenger mix, and leverage existing assets in the airport area in order to generate new sources of non-aeronautical income. Focusing on site-specific growth strategies, AU doesn’t rule out building an aerotropolis-style office park and convention center – if that’s really what local market conditions call for. At the same time, by taking a people-focused approach, the AU model opens up a much wider range of development options that are excluded by the narrow focus of the aerotropolis on office space and logistics parks. Doing so empowers us to see more clearly how airports and local communities can grow together for mutual economic benefit.